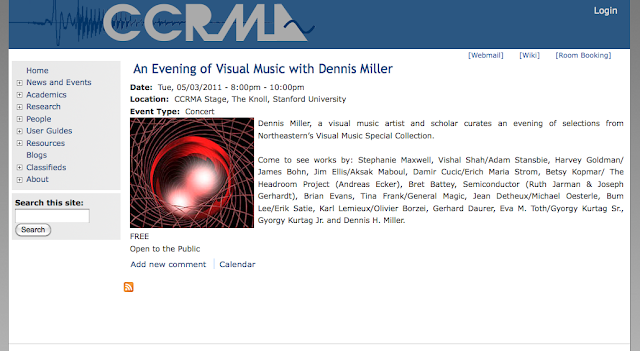 "Dennis Miller, a visual music artist and scholar curates an evening of selections from Northeastern�s Visual Music Special Collection. Come to see works by: Stephanie Maxwell, Vishal Shah/Adam Stansbie, Harvey Goldman/ James Bohn, Jim Ellis/Aksak Maboul, Damir Cucic/Erich Maria Strom, Betsy Kopmar/ The Headroom Project (Andreas Ecker), Bret Battey, Semiconductor (Ruth Jarman & Joseph Gerhardt), Brian Evans, Tina Frank/General Magic, Jean Detheux/Michael Oesterle, Bum Lee/Erik Satie, Karl Lemieux/Olivier Borzei, Gerhard Daurer, Eva M. Toth/Gyorgy Kurtag Sr., Gyorgy Kurtag Jr. and Dennis H. Miller."